A current view of the "Monument"
If you have good fortune of being a resident of Carter County at some point in your life, you are familiar with the two landmarks that have been part of the Elizabethton downtown area for more than a century. One is the Covered Bridge which was built in 1882 and the Veterans Monument that was erected in 1912. With the current layout of Elizabethton's downtown area, it seems that the "Monument" is at the end of the street and a little out of the way. The fact is that the monument was once the center of downtown. For many years the downtown area of Elizabethton ran parallel to the Doe River on Main Street. There was very limited access to the land west of the Doe River where our Historical Downtown area now exists. Due to the frequent flooding and the fact that the town was unable to expand due to the close proximity of Lynn Mountain to the Doe River, it was decided that access to the area west of the Doe River was needed for further growth. 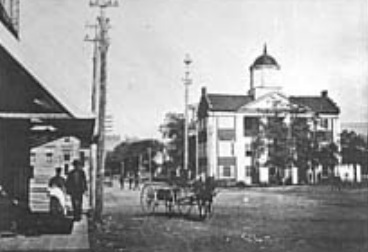 But for many years , the current downtown area was mostly residential and the center of town was still considered "Courthouse Square" which was on the East bank of the river. Several "Volunteers"" from this area left their homes and families in the late 1700's to serve in the Revolutionary War. Others fought in the Civil War that began in 1861. Many of those soldiers did not return home. It was decided that a memorial to these freedom fighters would be built in the center of Downtown. The "Monument" would be built so that we would always remember all those that fought in the Revolutionary War and all wars that followed. A large wooden structure was built around the west side of the Monument in the late 1940's that honored over 5000 soldiers by name. 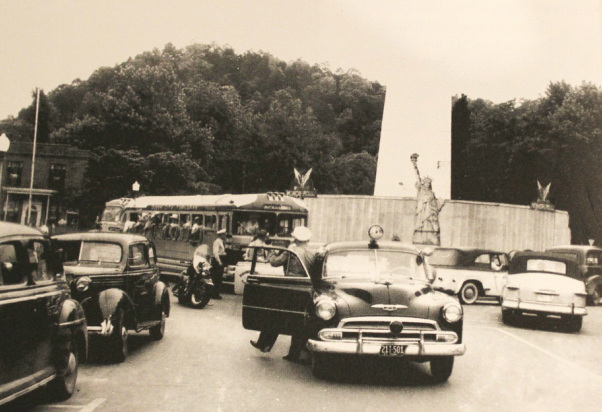 It was called the "Wall of Honor" There was also a replica of the Statue of Liberty which can be seen in this photo taken in the early 1950's. The form of the "Monument" is called an obelisk. This shape originated in the early Egyptian days and was used as a the entrance to the early temples. The Egyptians believed that if your name was not written somewhere, you would disappear after you died. This shape was chosen to represent the names of all the fallen soldiers. The base of the monument was constructed out of river rock that was brought form banks of the nearby Doe River and held together by hand mixed cement. The base measures about 20 feet and the body of the structure measures about 65 feet high, which was a significant height when built. The top is a single piece that is pyramid shaped. The "Monument " is guarded by two Civil War short field cannons, one facing north and one facing south. The Elk Ave. Bridge was once considered the entrance into the original Downtown area. This 1910 postcard was an artist's rendition of the vew as seen from the road in front of the old "Lynnwood Motel" on Elk Avenue. According to a fascinating article in the Elizabethton STAR by Editor Rozella Hardin, published Nov. 11, 2011, the memorial commemorates the service of Carter County soldiers in every war from the American Revolution down to the present time. She listed many soldiers from here that paid the ultimate price with their lives. 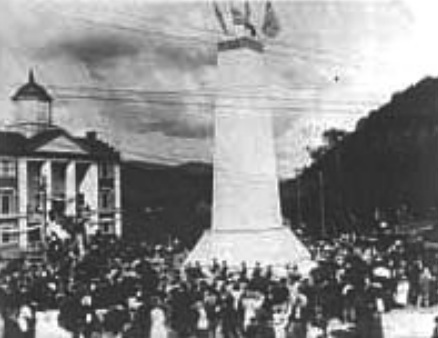 In the 1920s and 1930s — before radio and TV, hundreds of local residents would gather around the Monument on election night to await the results, which were read by the clerk at the courthouse. During World War II, a special dedicatory service was held around the monument when the Silver Star was presented posthumously to Robert Lee Davis, the first Carter Countian killed in that conflict. Improvements made to the "Monument" are usually funded by local veterans. The 100 year old "Veterans Monument" is one of the most significant landmarks of our area. It has overlooked our downtown area for more than a century. It has stood tall during many changes in our area. Our "Monument" has seen presidents, Urban Renewal, floods, and has bore the names of many fallen veterans over the years. It has received a couple aesthetic face lifts and improved landscaping over the years. Most of these improvements have been funded by local veterans. The latest improvement project was spearheaded by two local ladies Margaret Shell Allen, and Jean Harvey Crockett. The landscaping improvements were made possible by a donation by local Veteran Mike Melton according to an article that appeared in the Elizabethton Star. Each time we circle the "Veterans Monument", may we always remember the soldiers that have, and will continue to protect the freedoms that we enjoy every day.